(updated review coming soon) If you ride a bicycle and you plan to keep riding, this is a book you need to read and have available for reference. Authors Roy M. Wallack and Bill Katovsky are far more than just writers, they are avid cyclists. They cover training, eating, motivation, riding centuries and much more. Interviews include Gary Fisher, John Howard, John Sinibaldi, and Jim Ochowicz to name a few. Bike for Life is a "blueprint for using cycling to achieve longevity, fitness, and over-all well being." The second edition with lots of new content is coming soon. Look for my review here. Dennis Coello's new release is almost the same as the original book published in 1982. The publishers note at the front of the second edition says they have updated the resources. The book has a lot of good information for planning your bicycle tours, based on his real life experience. You will find an extensive checklist to prepare for bicycle touring. Chronicling Mike Trout's 3194 mile ride across America, this is a great book. He rode in 1997. The book was published in 1998 and now appears to be out of print. by Chris Carmichael, founder of Carmichael Training Systems. You will find invaluable tips, state-of-the-art exercises and workout programs to help you find your ultimate ride. I decided to keep a change in the difference in my saddle height and stem, after reading the book. Learn from legendary cyclist and coach, John Howard. The book includes workout plans for both fitness and competition. Mastering Cycling guides you in equipment selection, extensive stretching for flexibility, nutrition and fitting a bike. This book by Joe Friel is part of the Ageless Athlete Series published by Human Kinetics. You will find key training principles, advanced workouts for endurance, climbing and sprinting; advice for 100 mile events as well as multi-day tours. You will also find ideas for properly fueling your body and how to get mentally psyched to ride. This book by Jobst Brandt is now in its third edition. It covers what you need to either build or maintain your wheels. He covers different types of spokes, spoke patterns and the tools necessary to maintain your bicycle wheels. Your safety and your time in the saddle depend on a good set of wheels. "The bicycle tourist is concerned not with getting from place to place, but with what happens during the trip. The act of touring on a bicycle is a means and end for the bicyclist. Communing with nature and with people in places near and far is his goal; getting on to the next city is merely a byproduct of a week's enjoyment of the countryside. It is with this spirit that the novice bike tourer should approach a bike tour, just as the veteran biker does." This has made me rethink my plans for cycling across America in 2012. My early plans were for 80 to 100 mile days. Now I am thinking about a slower pace, with more time for taking pictures and meeting people along the way. Another feature of the older editions are the many photos, assembly drawings and maintenance instructions for vintage bicycle parts and components including vintage Shimano and Campagnolo. I am reading this book by David Herlihy now. Herlihy is a true bicycle historian and has a great writing style. 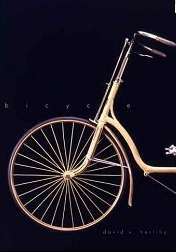 He traces the development of the bicycle from the days of the velocipede and novelty for the elite to transportation for anyone. The author traces the early development of the bicycle in the United States as well as in France. Many early drawings and photos illustrate the volume. Extensive references are provided for each chapter. 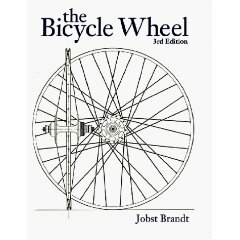 I recommend this one, if you want to know more about the history of the bicycle. 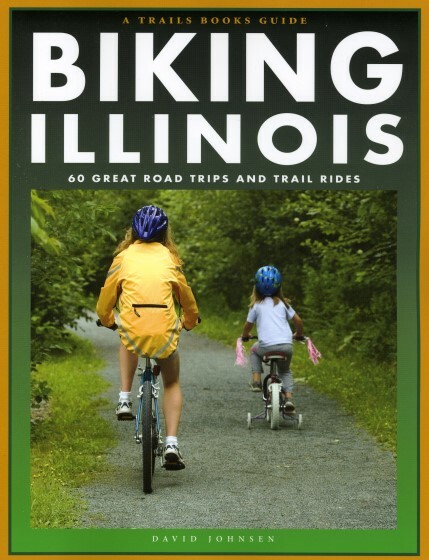 This is a great resource for rides in Illinois. Author David Johnsen covers rides on both trails and rides mapped on regular roads. I have been on several of the trails and ridden in some of the areas where other rides tour. Each of the rides has a summary with the location, distance, pedaling time, surface, terrain, "sweat factor", and trailhead. There is a written description and a full page map. Johnsen is experienced at touring by bicycle, cycling coast-to-coast in 2002. Todd Volker is the author of this one. The Grand Illinois Trail is over 500 miles long. It is one of the longest loop trails in the United States, including stretches along both Lake Michigan in the Mississippi River. The trail includes old stage coach routes, rail road corridors and river bottoms. I have only ridden on a few sections of this trail. 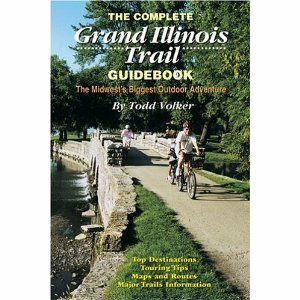 You will find this book useful, if you want to explore the Grand Illinois Trail and get the most out of your time. Beyond the typical guide for destinations, touring tips, maps and routes, you will also find special interest information, such as a list of uncommon or rare bird species found in McHenry County. There is information about hotels, motels, camping and bicycle repair centers. Convenient sections for north, east, west and south sections of the trail will help in your planning. Another unique feature I found is a listing of festivals along the way. A check list for sections completed and distance chart complete the book. M. Russ Lowthian details 41 road bike rides in Wisconsin, including maps and route directions. The book has sections for Northern, Eastern, Southern and Western Wisconsin. I book marked ride number 32, "Chocolate Lovers Ramble," beginning in Lake Geneva, Wisconsin. I've ridden around Lake Geneva, but this route includes Elkhorn and Burlington. This 42 mile route should be great for an early fall ride. Lowthian notes the terrain as rolling and also lists traffic and hazards for each of the routes as well as listing local information, including web links. 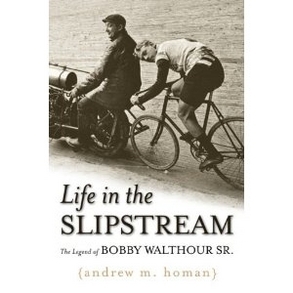 This book by Andrew Homan chronicles the life of Bobby Walthour SR. who rose from a bicycle messenger in Atlanta to a national cycling champion. ... from his beginning as an amateur racer he rose through the professional ranks eventually winning two national titles and two world championships. As the title suggests and the cover illustrates Walthour also raced in the slipstream of a motorcycle.